On May 26th. 2016, a medical visiting group, led by CEO-Mrs. Eppler Dorit and Chinese Medicine Supervisor-Dr. Armon Uri from Maccabi-Tivi Health Center in Israel had visited our hospital. The group of 19 crews includes practitioners of acupuncture, Tuina, and TCM Internal medicine doctors. As part of Maccabi Healthcare Service, the second largest Health Medical Organization in Israel, Maccabi-Tivi has 20 years history, dedicated to many kinds of complementary medicine. However, Traditional Chinese Medicine being its main stream medicine, now Maccabi-Tivi has 54 clinics across the country, provides wide variety of medical services. The delegation has visited Acupuncture Dept, Adult & Pediatric Tuina Dept, herbal pharmacy, and Internal medicine clinics etc. Dr. Xuan Lihua and Dr. Ye Shuliang had delivered lecture of abdominal acupuncture and Tuina hand manipulation for them. In the 3-day visit, our doctors had exchanged their rich clinical experience with the visitors, the distinctive treatment and its incredible effects have left them a deep impression. The CEO, Mrs. Eppler Dorit, have expressed strong interest to seek collaboration with our hospital. Dr. Cao Yi, Secretary of the Party Committee, said welcome speech to the visiting delegation. 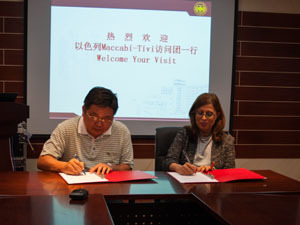 On behalf of the hospital, Dr.Cao had signed Memorandum of Understanding with Maccabi-Tivi Health Center. Both parties are looking forward to having more depth collaboration in the fields of clinical medicine, scientific research and education etc.